In 2017, BHCHP was happy to host over 50 health fairs for our 11,000+ patients. We hold them at our home facility at 780 Albany Street in the South End, as well as at many of our 45-plus clinic locations throughout Greater Boston, including Bridge Over Troubled Waters and St. Mary’s Center for Women and Children. We want to ensure that our medical and behavioral health care services reach as many individuals and families experiencing homelessness as possible. We love to see our patients at our Health fairs because it’s a low-key, friendly way to connect them to care. It’s also a great opportunity to reach new patients who may not be receiving care. Working with a variety of our partners, our staff can target different geographic locations and patient populations. At each fair, the health care offerings, food, and prizes are tailored to meet the needs of the specific population. For example, at a health fair aimed at families experiencing homelessness, we collaborated with the Fresh Truck to bring nutritious groceries and we provided child care so that the parents could participate in the fair while their children played, and enjoyed the arts and crafts. Activities at HER Saturday (Health, Empowerment, Resources), our weekly Saturday morning health fair for women at 780 Albany Street, include manicures, beading, and a writing group, while primary care, pap smears, and counseling are simultaneously offered on-site. La Fiesta de la Salud, a health fair aimed at the Spanish-speaking population and held in the wake of the hurricanes in Puerto Rico, was organized by BHCHP’s Immigration Health Committee. Spanish speaking staff and volunteers offered health care services, Cuban food was served, patients wrote notes of solidarity to folks in Puerto Rico, and some of our community partners provided information about Spanish-language services such as legal services and workers’ rights. Health fairs combine a festive atmosphere with convenient access to health care necessities. For example, most of our health fairs provide food, raffle prizes, and even haircuts to attract attendees. At the same time, staff, fellows, volunteers, and Consumer Board members from across the program offer services geared toward smoking cessation, nutrition, family planning, STI screening, Narcan training, mammograms and flu shots. When possible, we are able to include therapy dogs, to create an environment that is welcoming and stress-relieving for our patients, who have to face so many hurdles every day while navigating homelessness. And what do our patients think of our health fairs? Women who attend HER Saturday described it as, “a peaceful, happy environment,” and “a getaway from homeless time.” And that welcoming sense of community is paying off – attendance ranges from 40-70 women a week. We love that our patients feel a sense of community at our health fairs. 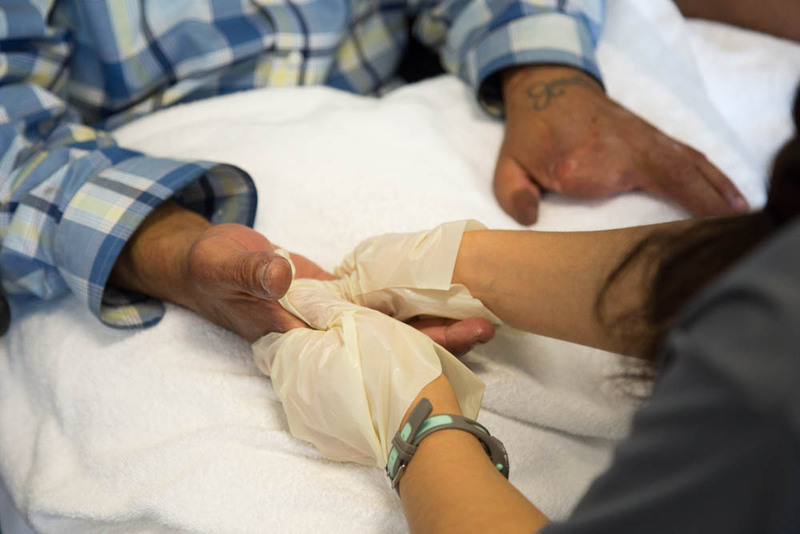 When patients have ease of access and are comfortable with their providers, they are more likely to stay connected to the integrated, highly skilled medical and behavioral health care that BHCHP provides for so many.